Helmet on, triple bell tassles waving, I am sunblocked and eager to make an early start and climb to the heights. Tobe likes to set the pace, he has a big stride and an easy gaited walk, and I am always deeply grateful that he is doing the walking and I get to go for the ride. 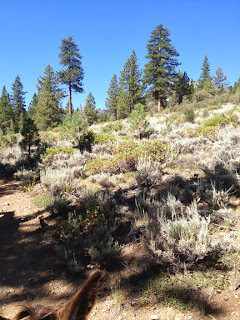 We kept an eye out for mule deer in the woodlands, pine forest thick with deadfalls and brush. We left the private property owned by our hosts and headed UP into the much higher areas in the National Forest. The base camp was at 6,200 ft, but the summit we attained was at 7,000 ft.
Underneath the pines was a charming plant known as "Mule Ears" and here we can compare Tobe's appendages with them. Someone's keen eyes saw a pile of bear poop on the trail, and all the horses and mules took a good look and a sniff. From then on we found ourselves encouraged to sing cowboy songs and let the bears know we were passing through. It was extremely bright at the high altitude, but we'd dip back into the shade of the trees. Then we turned a corner and there it was, a massive volcanic outcrop that was our destination. Until that moment we'd just been going up and down canyons and the horizon line was not visible. and made the push to the top. Once up on top the view was spectacular. This is looking out across dry ranchlands, very few people come to this area. And that's the high point of my travels. After a break and photo op we carefully came back down, had one last grand meal, and the next morning we all dispersed back to the real world. Except that JT & I took a detour to Reno, Nevada to buy Vaquero tack for Tobe which is now going to be the next big learning curve. We have returned to adventuring!